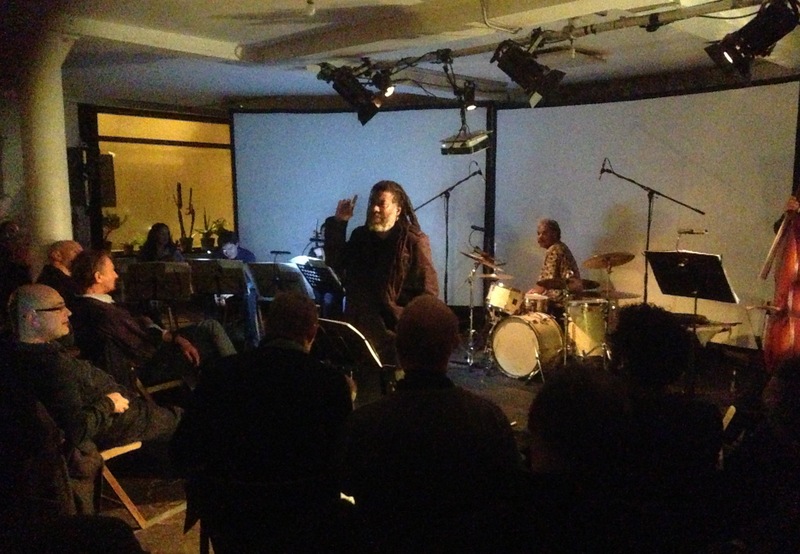 His Ten Freedom Summers may have been shortlisted for this year’s Pulitzer Prize, but that doesn’t mean Wadada Leo Smith has stopped work on the epic composition which he began writing more than three decades ago (and about which I wrote here back in August). During last night’s performance at Cafe Oto in London, the first of three across which he will deliver the entire sequence, he inserted an entirely new movement, and it turned out to be the most memorable of the lot. Smith arrived in East London with a slightly reduced version of the double ensemble that appeared on the 4CD version released by Cuneiform Records last year. Alongside his trumpet, the piano of Anthony Davis, the bass of John Lindberg and the drums of Anthony Brown were the Ligeti Quartet — Mandhira de Saram (first violin), Patrick Dawkins (second violin), Richard Jones (viola) and Ben Davis (cello) — with the video artist Jesse Gilbert operating from a desk next to the sound mixer. A clue to the inspiration behind the new movement, called “That Sunday Morning”, arrived when an image of a church appeared on the screens behind the players, followed by the faces of four young African American girls. They were Addie Mae Collins, Cynthia Wesley, Carole Robertson and Denise McNair, the four members of the congergation who died on September 15, 1963 when a group of Ku Klux Klan members set a bomb under the steps of the 16th Street Baptist Church in Birmingham, Alabama. It was one of the most terrible incidents of the long struggle commemorated by Smith through the titles of the other movements, which mention Dred Scott, Medgar Evers, Emmett Till, Rosa Parks, Martin Luther King, the Freedom Riders, and others. As you might have expected, the new piece adopted the mood of a threnody, a quiet and reflective lament that contained moments of striking beauty, particularly in Smith’s brief outbursts and in the rolling gospel phrases that Anthony Davis used sparingly but to very powerful effect. It was heartbreaking and spellbinding, and I hope the composer finds a way to record it in this form one day soon. Two hours of music, with hardly a break, passed quickly, as I imagine they will tonight and tomorrow. I found myself thinking that the rearrangement of the pieces for the string quartet, rather than the nine-piece ensemble used on the album, worked extremely well, and perhaps even better, thanks not least to the talent and commitment of the young British quartet, rising to the challenge of a masterpiece. Fifty years ago, a wholehearted embrace of American culture made even those of us 3,000 miles away feel we had a stake in the country’s destiny. So although we may have been neither American, nor black, nor even socially or economically disadvantaged, the March on Washington — which took place on August 28, 1963 — in some way felt as though it involved us, too, even if all we could do was cheer from the sidelines. Tens of thousands of people gathered in Washington DC this weekend to mark the anniversary. What I’ve been doing is reading my sometime colleague Gary Younge’s fine new book The Speech, which describes the process by which the Rev Martin Luther King came to write his “I Have a Dream” address, and listening to Ten Freedom Summers, a suite by the trumpeter and composer Wadada Leo Smith. If you don’t already know the latter, this is a set of four CDs containing four and a half hours of music divided into 19 individual movements based on themes from the civil rights struggle, performed by Smith’s quartet/quintet and a nine-piece chamber ensemble. Recorded over a three-day period in November 2011 and released last year on the Cuneiform label, it was one of three finalists for this year’s Pulitzer Prize. The titles of the individual pieces are sometimes suggestive — “Black Church”, “Democracy” — but usually more explicit in their references. “Dred Scott: 1857” is the first movement, referring to the Missouri slave who unsuccessfully sued for his freedom in that year. “Rosa Parks and the Montgomery Bus Boycott: 381 Days” is another. There are references in other titles to Medgar Evers and Emmett Till, to JFK and LBJ, to the Supreme Court justice Thurgood Marshall and to Malik Al Shabazz, better known as Malcolm X. Unlike some of the music that accompanied the civil rights struggle, from John Coltrane’s miniature masterpiece titled “Alabama” (a threnody for the four black schoolgirls killed in the Birmingham church bombing in September 1963, barely a fortnight after the March on Washington) to Bob Dylan’s “The Lonesome Death of Hattie Carroll”, there is nothing in Smith’s work here that explicitly evokes his subject, no overt gestures that would indicate a relationship to his chosen titles. This does nothing to diminish its extraordinary power. Smith, who was born 71 years ago in Leland, Mississippi, first came to notice at the end of the ’60s, as a member of the Association for the Advancement of Creative Musicians in Chicago, along with Roscoe Mitchell, Anthony Braxton, Muhal Richard Abrams and others. His bands included the Creative Construction Company, with Braxton and the violinist Leroy Jenkins, and New Dalta Ahkri, whose personnel included Henry Threadgill, Oliver Lake and Anthony Davis. Along with other members of the AACM, he spent time in Paris in 1969 and became acquainted with the new generation of European free jazz musicians. 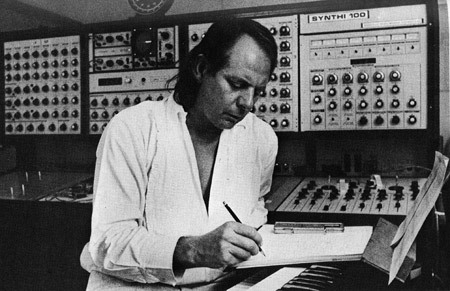 His many recordings have appeared on the Kabell, Nessa, ECM, Leo and Tzadzik labels, as well as Cuneiform. As a trumpeter, he had his own character from the beginning. If you wanted a shorthand description, I suppose you could say that he occupies the space between Don Cherry and Lester Bowie. But the originality and substance of his playing are more than enough to command the attention all the way through this mammoth undertaking, in which his is necessarily the dominant voice. I’ve always liked his tone, open or muted, and the crisp assertiveness of his phrasing, and the sense of poise he conveys. The long-standing nature of his partnership with the pianist Anthony Davis, who appears here, is evident in the closeness of their dialogues. Like Smith, Davis is a quietly original musician who, in his own compositions as well as his playing here, demonstrates complete comfort with the idea of bringing together elements from African American and European musical practices. The basic group is completed by John Lindberg, an exceptional bassist, and two drummers, Susie Ibarra and Pheeroan Ak Laff, who alternate on some pieces and play together on others. Sometimes Smith employs gestures immediately identifiable as drawn from jazz: “Thurgood Marshall and Brown vs Board of Education” finds Lindberg anchoring the piece with a slow-grooving funky bass figure, while the interplay between Davis and Ibarra on “The Little Rock Nine” is outstanding. Elsewhere the climate resembles that of classical chamber music: passages for flute, harp and strings in “Medgar Evers: A Love Voice of a Thousand Years’ Journey for Liberty and Justice” have a watercolour delicacy that reminds me of Toru Takemitsu. But more often it seems, to employ Duke Ellington’s phrase, beyond category. The chamber group — basically a string quartet plus harp, clarinet, flute, percussion and an extra violin — appears both by itself and with the quartet/quintet. So organic and unselfconscious is Smith’s writing that the frontier between the two groups disappears, as does the line between composition and improvisation. The prevailing mood, not surprisingly, is soberly reflective. Even so many years after the events Smith is commemorating, there is much to reflect on. This is not a bruising experience; the writing and playing are characterised by a sustained lyricism. 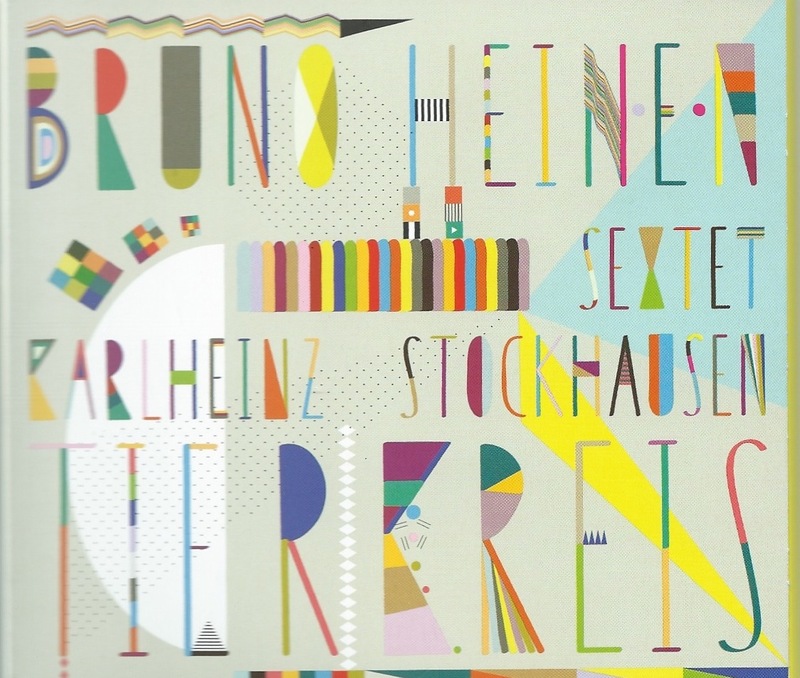 Nevertheless few will want to absorb all four and a half hours in at one sitting, and it may a take listener years to become as familiar with these individual pieces as with the much shorter jazz classics of earlier eras. But that doesn’t seem to matter. Smith’s work exists on its own terms, a marvellous tribute to its immense subject. 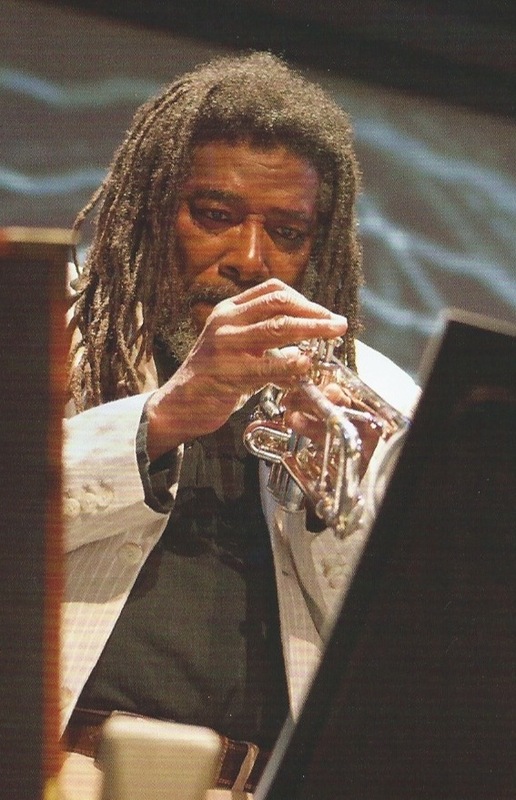 * The photograph of Wadada Leo Smith was taken by Steve Gunther and is from the booklet accompanying Ten Freedom Summers. Gary Younge’s The Speech is published by Guardian Books.